There are 24,000 islands and islets in the Stockholm archipelago. And if you have time to visit only one of them, then Vaxholm it should be. Vaxholm is situated on an island, but is linked to the Swedish mainland by a series of road bridges, and a bus service connects the town to Stockholm city. 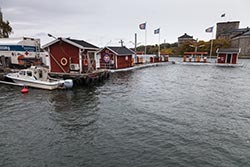 The Waxholmsbolaget and other ferry lines also provide boat services to central Stockholm and many of the other islands of the Stockholm archipelago. Instead of taking a ferry, we decided to use the combination of metro and bus to reach Vaxholm. From the central station we took the metro 14 to Danderyds Sjukhus. From there a bus took us straight to Voxholm. Give about 60 minutes for the journey. The bus ride gives the opportunity to see the beautiful countryside and its waters. 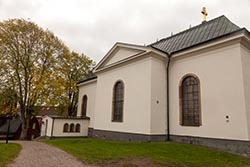 Vaxholm is often referred to as the capital of the archipelago. People here have lived off herring fishing for many generations. In the 1500s, King Gustav Vasa decided to put the defense of Stockholm's inlet here. 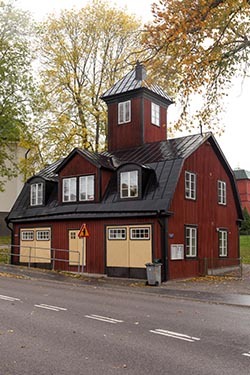 It was the beginning of what would be almost 500 years of military history for Vaxholm residents. The Citadel still stands on the strait just outside the city. A visit there will bring you back to a time when the old fortress was its own little society populated by senior military officers and their wives, soldiers, servants and prisoners. Toward the end of the 1800's, Vaxholm became a popular resort area for Stockholm's socialites. It was also around then that the city became known for its Vaxholm herring - a delicacy that is still served today at local restaurants. Vaxholm is now a lively island city where fishing huts and large houses coexist with small shops, cafés and restaurants. There are also several nice beaches, beautiful nature and some of Sweden's best water sports clubs. 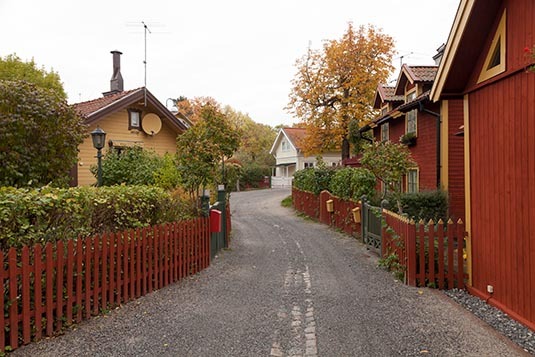 Its proximity to Stockholm and central archipelago location make Vaxholm a perfect destination whether it's for a day trip, weekend holiday, or as a base for day trips to other islands. Sadly, it was cloudy with some rain when we reached Voxholm. It was a Monday morning and though it was almost noon when we arrived, most of the shops and cafe were closed. Not sure, if it was a holiday or whether the town opens up late! Anyway, we walked the town for a couple of hours admiring its beautiful houses, tree-lined streets, Vaxholm church and of course the town’s main road - Hamngatan. Though we had plans to hire a boat and visit few of the other islands, we couldn't find any boats to show us around. With summer behind us, it could be the lean season. So be it. The return journey was exactly as we had come. On arriving in Stockholm, we grabbed a late lunch and walked the old town. We would leave Stockholm early next morning. It was a good idea to pre-book our taxi from the hotel's concierge. At 6 AM, the next day, we were off to the airport, with boxed breakfast in hand, to catch our flight home.